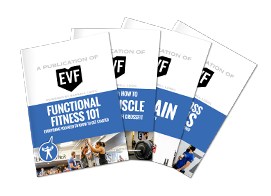 EVF Performance CrossFit, on the Upper East Side and at Columbus Circle/the Upper West Side, is all about functional movement, not mirrors and machines. Personal attention from insightful instructors, supportive peers and zero attitude or ego are just the beginning of what you’ll find here. We offer CrossFit, EVF Kids, Private training, our signature EVF 360 conditioning program, and so much more. Fitness creates opportunity and freedom. What we learn in life applies to the gym, and vice versa. How we handle small things shows how we will handle big things. Training teaches perseverance, dedication, courage, and sacrifice. Life is easier when we are strong. Strangers are simply friends we haven’t met yet. The greatest strength comes when we lift each other up and overcome our limitations. Not ready for CrossFit? Try EVF 360! Find out more about our high-intensity strength and conditioning program HERE! EVF Performance CrossFit’s two locations — Upper East Side and Columbus Circle — offer everything you need to get stronger, leaner, and healthier here in New York City. Our gyms are overstocked with all the top-of-the-line CrossFit equipment you know and love (and sometimes love to hate), so you never waste your precious workout time waiting for a machine or bar. Ample space for classes, private training, and events means you never lose your mojo by tripping over a weight rack or face-planting into your sweaty neighbor. Here you will find a community of fitness friends who will support to reach your personal goals inside and outside the gym. Our Columbus Circle location is also home to Row House, a rowing gym located on the first floor. All of the coaches here are great and really make you feel like you are part of a family. At the beginning of every class, you do an icebreaker with the coaches and other members so that you know who you are working out with. It's really a great system. I've met some awesome people at EVF. These are the kinds of guys who are totally into fitness and CrossFit and love to teach you all they know, but also like beer, baseball, Broadway shows and have real lives that require eating carbs. There is zero attitude and zero intimidation, which I see is a big concern for many who are trying out CrossFit gyms. Best box in the city. Period. Most gyms let you lift. EVF lifts you. I've been with EVF since they opened and they are terrific. Having EVF and the community in my life has been a godsend. I feel better, my fitness has improved and I feel I have a fantastic community to share it all with.